This archive holds all posts form July 2010. This imagery of African Americans as savage and uncivilized also dates back to the 1500s and 1600s, and was originally (and ironically) created by slaveholding, and highly savage, Europeans. These and many other racist comments from Limbaugh regularly suggest and reinforce old racist images of African Americans, or variations on four centuries old racist stuff. White-racist commentaries are amazingly un-original and parrot-like. Conformity to past racist imaging is essential to contemporary racist thinking. how propaganda, including systemic biases, function in mass media. The model seeks to explain how populations are propagandized and how consent for various economic, social and political policies are “manufactured” in the public mind. Radical-right talk show host like Limbaugh, with their millions of listeners, play a central role in this propagandizing and keeping the United States are foundationally and fundamentally racist society. Large-scale and organized action to create alternative media networks of equal power are essential if this huge propaganda process is ever to be effectively countered. In 1974, a National Opinion Research Center (NORC) study of white ethnic groups showed that white Baptists nationwide averaged only 10.7 years of education, a level almost identical to blacks’ average of 10.6 years, and well below that of most other white groups. A recent NORC Social Survey of white adults born after World War II showed that in the years 1980-2000, only 18.4% of white Baptists and 21.8% of Irish Protestants—the principal ethnic group that settled the South—had obtained college degrees, compared to a national average of 30.1%, a Jewish average of 73.3%, and an average among those of Chinese and Indian descent of 61.9%. Nondiscrimination laws should be applied equally among all citizens, including those who happen to be white. Webb is right to note that white Americans are not a monolith and that there are poor whites among the racial category “white.” However, just because Webb has discovered poor white ethnics does not mean that white privilege is a myth. There are so many examples of white privilege that it barely merits listing them all again, but just in case you’ve never read Peggy McIntosh’s “White Privilege: Unpacking the Invisible Knapsack,” review it now. Someone accused of killing a white person in North Carolina is nearly three times as likely to get the death penalty than someone accused of killing a black person, according to a study released Thursday by two researchers who looked at death sentences over a 28-year period. People are generally aware of the fact that the criminal justice system sanctions African-American suspects and perpetrators disproportionately harshly. Less noted, but in some ways even more pernicious, is the way it affords lesser protection to African-American victims and potential victims. Randall Kennedy’s Race, Crime, and the Law explicates this neglected issue in an excellent way. 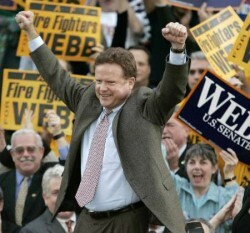 So, while I will be the first to applaud the end of white privilege, we’re not there yet, Sen. Webb – not by a long shot. Civil Rights Review: Do you know these courageous women? There’s a good bit of scholarship on the civil rights movement which documents the ways that women have been written out of civil rights history. So, in honor of Ms. Sherrod and to remind people about women’s influence in civil rights history and the struggle for racial justice, I’ve assembled a short list of women who might be called civil rights heroes. Do you know these courageous women? Ida B. Wells-Barnett was a journalist and anti-lynching activist and suffragist who led the way in the struggle for racial justice at the end of the 19th century and beginning of the 20th century. Many people believe that the foundations of the civil rights struggle were laid down in the fight against lynching. (Factoid for sociology geeks: Troy Duster is a descendant of Wells-Barnett.) You can read more about Wells-Barnett here. 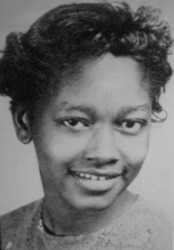 Claudette Colvin is a African American woman from Alabama sometimes referred to as “The First Rosa Parks.” In 1955, at the age of 15, she refused to give up her seat on a Montgomery bus to a white person, in violation of local law. 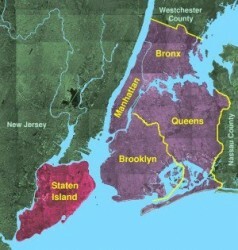 Her arrest preceded Parks’ (on December 1, 1955) by nine months. You can read more about Colvin here. Ella Baker was perhaps the consummate organizer within the civil rights movement. She began her organizing career in the 1940s with the NAACP. In the 1950s, she helped Dr. King organize his Southern Christian Leadership Conference (SCLC). And, in the early 1980s, when she wanted to assist the new student activists she organized a meeting at Shaw University for the student leaders of the sit-ins. From that meeting, the Student Nonviolent Coordinating Committee (SNCC) was born. In many ways, SNCC was the forerunner of the Black Power and Black Panther movements. You may have heard SNCC mentioned in recent days as Ms. Sherrod’s husband was a member of this organization. You can read more about Ella Baker here. Mamie Till-Mobley was the mother of Emmett Till, a 14-year-old African American boy who looked at a white woman (some say whistled at her) and for that was lynched in 1955. Mrs. Till-Mobley made the heroic decision to have an open-casket funeral. At the time of her death, Jesse Jackson remarked about this decision: “She was a very articulate teacher who saw the pain of her son and did a profound, strategic thing.When they pulled his water-soaked body from the river, most people would have kept the casket closed. She kept it open.” The press took pictures of Till with a bullet in the skull, an eye gouged out and his head partially crushed. His body had been found floating in the Tallahatchie River, identifiable only by the ring Till wore that belonged to his late father. These photos were widely published and attributed with helping to galvanize the civil rights movement. 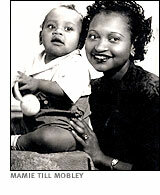 You can read more about Mamie Till-Mobley here. Fannie Lou Hamer was the daughter of Mississippi sharecroppers, who became one of the most dynamic speakers of the civil rights movement. She is widely known for the phrase “I am sick and tired of being sick and tired.” Hamer became active in the movement when members of the Student Nonviolent Coordinating Committee (SNCC) and the Southern Christian Leadership Conference came to Mississippi. She worked on voter registration drives in the South. She was among several workers stopped by officials in Winona, Miss., on June 9, 1963. She and other workers were jailed and beaten. SNCC lawyers bailed her and the others out and filed suit against the Winona police. All the whites who were charged were found not guilty. She continued to work on grass-roots anti-poverty, civil rights, and women’s rights projects into the 1970s. Daisy Bates was a mentor to the Little Rock Nine, the African-American school children who integrated Central High School in Little Rock in 1957. She and the Little Rock Nine gained national and international recognition for their courage and persistence during the desegregation of Central High when Governor Orval Faubus ordered members of the Arkansas National Guard to prevent the entry of black students. She and her husband, Lucious Christopher (L. C.) Bates, published the Arkansas State Press, a newspaper dealing primarily with civil rights and other issues in the black community. You can read more about Daisy Bates here. Violet Liuzzo was a civil rights activist from Michigan and mother of five who left her home to become involved in the civil rights movement. She was inspired to act after seeing protesters assaulted by police in Selma, Alabama and reportedly told her husband, “this is everyone’s struggle.” While driving protesters in Alabama, was murdered by Ku Klux Klan members. You can read more about Violet Liuzzo here. 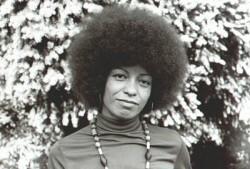 Angela Y. Davis was an early pioneer in seeing the connections between the struggle for racial justice, gender equality and the prison-industrial complex. Her book, Women, Race & Class in many ways launched what we think of today as “intersectionality” studies. Davis is probably most widely known for the fact that in 1970, she became the third woman to appear on the FBI’s Most Wanted List when she was charged with conspiracy, kidnapping, and homicide. She evaded police for two months and was eventually arrested. She was tried and acquitted of all charges eighteen months after her capture. Her trial became a focus of the Black Power movement as people wore buttons with her iconic afro with the words “Free Angela” around it. Years later, she would write “Afro Images: Politics, Fashion and Nostalgia,” (Critical Inquiry, 21(1):37-45), in which she would bemoan the fact that people remember her as simply “the afro” and critique the fact that “a politics of liberation could be reduced to a politics of fashion.” You can read more about Angela Y. Davis here. Beulah Mae Donald‘s son, Michael, was lynched by two members of the Ku Klux Klan in 1981 in Mobile, Alabama. Upset about the verdict in a trial of an African American man for the murder of a white cop, KKK members Henry Hays and James Knowles spotted Michael Donald walking home from getting his sister a pack of cigarettes. They kidnapped him, drove out to a secluded area in the woods, attacked him and beat him with a tree limb. They wrapped a rope around his neck, and pulled on it to strangle him, before slitting his throat and hanging him from a tree across the street from Hays’ house. Local police first stated that Donald had been killed as part of a drug deal gone wrong, despite his mother’s insistence that he had not been involved in drugs. Beulah Mae Donald then contacted civil rights leaders and the Southern Poverty Law Center. Eventually, the SPLC won a civil victory against the KKK. In 1987, Ms. Donald won a judgment in the amount of $7 million dollars against the KKK and as a result, the group was forced to turn over its headquarters to her. The verdict marked the end of the United Klans, the same group that had beaten the Freedom Riders in 1961, murdered civil rights worker Viola Liuzzo in 1965, and bombed Birmingham’s 16th Street Baptist Church in 1963. You can read more about Beulah Mae Donald’s successful case against the KKK here. These are just a few of the people who’ve struggled to bring about racial justice. Did you know all the names? The House passed legislation reducing the two-decades-old sentencing disparity between crack and powder cocaine offenses. The Senate passed an identical bill in March and the legislation is now heading to President Obama, who supports the reform effort (h/t Drug Policy Alliance via Julie Netherland). This is good news in the struggle for racial inequality because sentencing for powder cocaine, disproportionately used by whites, has traditionally had much lighter sentences than for crack cocaine, more often used by African Americans. These unjust sentencing laws were enacted in the 1980s, under President Ronald Reagan. A federal judge blocked the most controversial parts of Arizona’s immigration enforcement law from going into effect. Judge Susan Bolton took aim at the parts Arizona’s draconian immigration law that have generated the most controversy, and issued a preliminary injunction against sections that called for police officers to check a person’s immigration status while enforcing other laws and that required immigrants to carry their papers at all times. This is good news in the struggle for racial equality because it means that Mexican Americans and Mexican immigrants living in Arizona may be able to live their lives without being harassed. These changes are good news and evidence that struggle can create progress, but make no mistake – these are small changes. And, these small changes that took large numbers of people, several agencies and non-profit organizations, and legislators to create. There still remains a lot of work to be done around drug policy and around immigration reform. Drug laws are perhaps the centerpiece in the racial caste system of that is the U.S. criminal justice system. Arizona’s Maricopa County Sheriff Joe Arpaio says that he will arrest any one protesting the immigration law there. If and when big change comes in these arenas, it will be because people worked and struggled to make change, not because there is some inevitable, progressive trend toward racial equality. The Andrew Breitbart and Fox News smear of former USDA Shirley Sherrod, and the NAACP and White House’s complicity in her defamation and firing, still has lots of people thinking and talking about race and racism. Unfortunately, the focus has been on individual racism. This is a proposition we’ve got to rethink. Racism, as we’ve discussed here and elsewhere, is systemic. If you’d like to know what systemic racism at the USDA looks like, it looks like this. Black farmers have been systematically discriminated against by the USDA for decades. They were due assistance – given to white farmers, but not to black farmers – and were denied this because of their race. Black farmers went to court to get redress for this, won the case, but still cannot get the money that is owed them. There was another set back for black farmers this week, as the Senate stripped $1.2 billion for the claims from an emergency spending bill, along with $3.4 billion in long-overdue funding for a settlement with American Indians who say they were swindled out of royalties by the federal government. What the right wants us to forget is that race relations are rooted in systems, and that not all racism is individual, intentional and overt. Individual bias plays a role, to be sure, but it’s the institutional rules, written and unwritten, that enable such racism, not the other way around. You can’t “heal” a system; you have to rebuild it. This is where the left often loses its way on race. I was surprised, for instance, to read the following in Joan Walsh’s Salon.com column on Wednesday: “People are spending a lot of energy to get folks like the Spooners and Sherrod to think they should be enemies, when the real issue is class.” Walsh, who has a solid history of responsible reporting on race issues, goes on to say that’s what the left should remember from this debacle, because the right wants us to forget it. I take the opposite lesson: The intersection of race and class is a complicated thing, deserving of more attention, not less. Treating class as the “real issue” means treating race only as a function of it, which amounts to colorblindness for leftists. It’s a highly limited answer to working-class white resentment of working-class black people. Progressives’ over-reliance on the “same boat” argument doesn’t help keep multiracial alliances together. Rather, it stumps us when we need to explain exactly how racism works, not just in the economy, but also in education, prison, health and, yes, agriculture. Liberal silence on race is what allows Breitbart to distort the definition of racism, to strip it of all discussions of power, history, policy or collective responsibility such that the notion of reverse racism has enough merit to be taken seriously in the first place. Sen is spot on here when she notes that the progressive left’s inability to speak cogently on race is what opens up a space for right-wingers like Breitbart. She also makes an excellent point about the overlap between race and class. Perhaps this will serve as a wakeup call for those on the left to get smarter about race and racism so that they aren’t “snookered” by the likes of Breitbart again. On July 28th, 2010 hundreds of children will march in front of the White House in Washington D.C., in Los Angeles in front of the Federal Building, and in Mexico City at the US Embassy. They march to deliver a letter to President Obama and to protest the tragic situation of children being taken from their undocumented parents following deportation. The children who are separated from their parents often end up in the foster care system. Once in this system, it becomes almost impossible for the parents to get them back because of language difficulties, legal status, resources, and understanding how to negotiate the complex system. In an effort to provide a better life, these parents lose the most important and precious thing in the world to them and all because they wanted to a life free from destitution and poverty. We’ve come a long way from Emma Lazarus’ “Give me your tired, your poor, Your huddled masses yearning to breathe free…” written in 1883. Knowing that this is the immigration policy that the U.S. is enforcing, there are those who may not comprehend how parents could take such a high risk to lose their children by working here without the proper documentation. Well, imagine you live in a community that has suffered tremendous financial hardships, particularly since the passage of the North American Free Trade Agreement, which has obliterated the local corn market because it couldn’t compete against the government subsidized corn imports from the U.S. Your main source of income is gone. Your children wear clothes made out of old flour sacks, they don’t have shoes on their feet, they don’t go to school, and they rarely eat meat. You’ve started giving your six-year old coffee to fill him up. They cry from hunger and when they get sick there is nothing you can do. The only answer seems to be to work in the U.S. Your options are to either leave your young children behind knowing full well that by the time you return they will not even remember who you are, or you to take them with you. You don’t fully understanding that if you get deported, the cost is that you might lose them forever. If we put ourselves in this position, not many of us could sit back and watch our children suffer hunger and destitution without doing something, anything to ease their suffering and improve their lives. This is why so many parents risk everything, leave everything, and come to work in the US. When did separating very young children from their parents because of deportation policies become American values? Most people cannot imagine the destructive long-term consequences these policies are having on immigrant families—for years. It should take far more severe than trying to earn a living even while working without the proper documentation to justify the government separating parents from their young children. The act of dividing families, particularly families of color, reveals a dark side of America—one we have seen before with black slave children removed from parents and sold off like if they weren’t even humans and with Indian children who were removed from their homes and placed in boarding schools to teach them how to be white people. Americans justified these atrocious acts in the past and we are doing it again. Will people of color, especially the poor and the most vulnerable, ever be seen and treated as human beings in this country by most people? If they were surely these policies would not be sustainable. Until the Obama administration or the Congress have the guts to fix our immigration system, the most compassionate means of enforcement need to be found. And it cannot and should not involve the kinds of family tragedies that take children away from their parents. It reminds me very much of the Academy-award-winning of 2004, “Crash.” I heard this story breaking, and I thought, this sounds like that film to me. If you remember that film, the first act of really horrifying racism occurs when the white police officer puts his hand up an African American woman’s dress, a sexual assault on her. But – in a scene right after that – we see a black woman bureaucrat refusing government services to this police officer’s aging father. The idea in that film, that the movie made …and we embraced it as a country and felt good about awarding the Oscar … is that the police officer and the low-level bureaucrat are the same, all prejudice is equal, this is the thing the NAACP is moved to do, it’s to explain that it is structural racism matters, not just momentary lapses of prejudice. Even if that tape had been true, it would not have been the equivalency of Jim Crow, to slavery, to institutional racism. While many of the mainstream news outlets will blame this on Fox News, or a conservative blogger, or the White House’s “race to judgment,” the fact is that the vilification of Shirley Sherrod is indicative of a larger pattern of systemic racism in the U.S., and the particular way that black women get vilified in this culture. UPDATED: For further context on the real racism happening at the USDA, check this link about the systematic pattern of racism at the agency, whose own Commission on Small Farms admitted in 1998 that “the history of discrimination at the U.S. Department of Agriculture … is well-documented” — not against white farmers, but African-American, Native American and other minorities who were pushed off their land by decades of racially-biased laws and practices. lead to disproportionate stops and detentions for tribal members, violate their sovereignty and negatively impact the tribal economy. Police officers, especially white officers, are likely to target Native Americans, because they often look Latino. I wonder why that is? Could it be because a majority of Mexicans and Mexican Americans have substantial Native American (indigenous) ancestry? Hmmm. Does that also mean that a majority of current Mexican immigrants have deeper historical and ancestral roots in North America, and in what used to be northern Mexico (e.g., Arizona), than European Americans?